You are going to Watch Teen Titans Go! Episode 2 online free episodes with HQ / high quality. Stream cartoons Teen Titans Go! Episode 2 Online Driver’s Ed/Raven’s Daddy Dearest. Robin had gotten his drivers license suspended after wrecking the Batmobile and must take Driver’s Ed. What Robin doesn’t know is that his driving instructor Ed has some sinister tricks up his sleeve where uses Robin as a getaway driver. Raven’s inter-dimensional demon-father Trigon cozies up to her four best friends in hopes of luring her over to the dark side. He gives the four Titans a new special ability of their own. 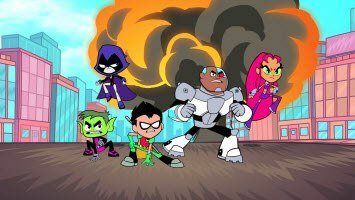 Starfire is now speaking just like an Earth teenager and using teenage slang, Beast Boy can now transform into anything he wants, Cyborg has a dog for a right hand, and Robin is totally buff and muscular. 4 / 5 - 68 ratings.